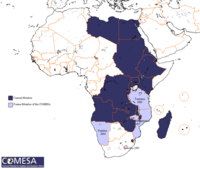 The COMESA was founded in December 1994, replacing the earlier existing Preferential Trade Area(PTA). independent sovereign states which have agreed to co-operate in developing their natural and human resources for the good of all their people”. Hence, the COMESA was formed with the main goal of creating an economic bloc, and help overcome economic and trade barriers between the individual member states.